For Cylinderal / Curved Objects Screen Printing Machine(WE-100C) - Guger Industries Co., Ltd.
With electro-mechanism control requires no compressed air, no noise and vibration, easy operation and maintenance. A three operation mode "MICRO-ADJUSTMENT", "SEMI-AUTO" and "AUTO" can be selected for a proper printing and operation. 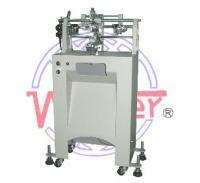 Adjustable printing rod is available for large printing area and longer stroke. Suitable for round type plastic or metal pens, small round tubes and other, etc.